Blackjack Billy OUTLAWS & ANGELS 2017 Summer Kick-Off Concert Party! BLACKJACK BILLY + Special Guest, Madeline Merlo & Kansas Stone! 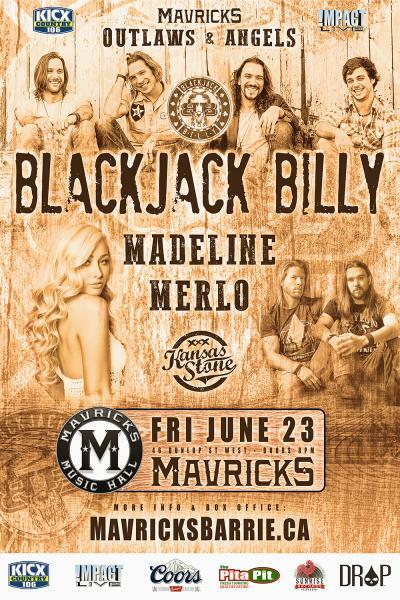 BIG SHOW BONUS for Country Music Fans – A surprise MAJOR ARTIST will perform with Blackjack Billy next Friday night @ Mavricks! Got a feeling June 23rd “OUTLAWS & ANGELS 2017” is gonna go down as one of the BEST kick-offs to summer in country music history! VIP TICKETS include faster entry, VIP credentials & access to VIP balcony with limited seating available on a first come, first seated basis!